The UK-based band Slovo has released a new song which calls for a boycott of the Eurovision Song Contest final, which will be held in Tel Aviv on the 18th of May. 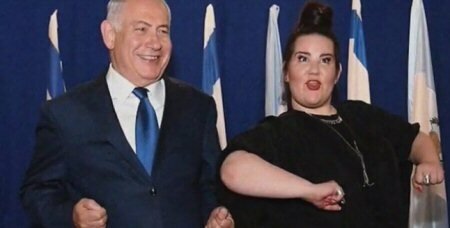 Entitled ‘Not My Kinda Party’, the song refers to Israel as an apartheid regime, and lists aspects of the government’s policies, including ‘illegal settlements’ and ‘kids in prison’ followed by the verdict ‘Nul Points’ (a reference to infamous zero score at the Eurovision Song Contest). The song release comes just two days after the announcement of a “Not the Eurovision: Party for Palestine” gig set to be held in London on the same evening of the final of the Eurovision Song Contest, in support of Palestinian rights. The gig, organised by Palestine Solidarity Campaign, will feature a performance from Slovo’s Dave Randall, as well as a live set from rapper Mic Righteous and a DJ set from alternative rock band and Mercury Prize-winners Wolf Alice. More acts are yet to be announced. In 2005, 170 Palestinian civil society groups including trade unions, women’s organisations, community groups and NGOs voted overwhelmingly to issue a call for a boycott of Israeli institutions including a cultural boycott. That call remains in place, and is campaigned for by the Palestinian Boycott National Committee. It is also supported by Israeli activists including the group Boycott From Within. The song release is supported by The Palestine Solidarity Campaign. Slovo’s bandleader is former Faithless guitarist Dave Randall. He says: ”In 2010 the band Faithless, with whom I played guitar, declined offers to play in Israel, joining the boycott in solidarity with Palestinians. Prior to the call being issued, Faithless did perform in Israel – once at a rave on a beach south of Tel Aviv, and again at a music festival in Haifa.